I don't railfan much anymore, but when I saw these locomotives together I knew it was something special. PAR EDMO sitting in Eagle Bridge, waiting for a loaded coal train to pass, with ST 621, B&M 69o and ST 643. Last couple of shots of EDMO through Reynolds. These are the last three six axles left on the PAR roster. Two SD-26's and the SD-39 in the middle. You can join me in celebrating tonight! I have been contacted by David Baule, Executive Producer of the PBS tv series TRACKS AHEAD. They would like to interview me as well as show several of my night photos in a segment to be included in a future program! Life is great! The interview shoot is planned for August 9th, to be seen on PBS channels country wide! It's pleasure to share some GOOD news with all of you! More good news! NIK Software, announced last night that Color Efex Pro, has been upgraded for use in Lightroom 2.0! Previously this set of filters, several of which I use much of the time, was available only for photoshop. The downloadable upgrade comes FREE to registered users! Hat's off to the NIK folks! This changes everything again! This spot on CSX ex-Clinchfield route is famed for it's past PR photo shoots. The night view shows off it's continuing attractiveness. We're just over the Tennessee border here in Huntdale, North Carolina, and a fair bit of driving awaits Gary returning to the compound in Hinesburg! Ha! Seeing no reason to rush into heading "nord", amid warm temps., I spent three enjoyable nights here and at Relief, a mile or so east. The railroad hugs the serpentine curvature of the North Toe River for many miles here, set in a surprisingly deep valley cut through the rolling hills which grow eastward into the Blue Ridge. The tiny communities trackside close up shop at night, leaving you alone with the railroad and river. A most relaxing and enjoyable combo for Gary! My second night here, I must have seen thirty trains pass by between 20:00 and 07:00. Wow! Of course, the majority were going the wrong way, ha,ha,ha! But, all I needed was one, and after hearing several westbounds that had passed me earlier go in the hole, success came with this eastbound loaded coal train, led by an AC6000. A dramatic buildup preceeded the 692's appearance, as crews talked to each other during meets upriver at Poplar and Peterson and a talking detector was acknowledged. I'm sure approaching crews were made aware"someone" was at the church in Huntdale taking night photos! 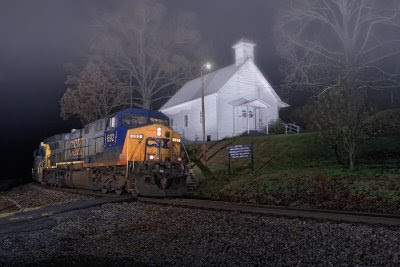 Then a headlight was sighted, you hear GE's choppy exhaust, headlight glow follows the sharply curving river, disappearring for moments until the photogenic church itself became backlit, and CSX 692 swept around the curve and past me atop the stepladder! An AC6000, I like that gold CSX on the hood! Trains move right along through here, I'll guess thirty mph, and the GE was doin' it's trademark chuggin'. What a photo with the church at night! Thanks to Mitch Goldman for providing initiative/reviews while I re-examined processing techniques! Thanks to David Baule (TRACKS AHEAD) and Jim Wrinn TRAINS editor for the great news! Shot on October 30, 2006 with the 5D and Canons 35/1.4 lens set at f2.8. Please enjoy! Comments are welcomed.